Hoping this makes it's way into CS6, but I'd like to be able to customize the tool set in the tools panel. I tried the Configurator (which wasn't bad), but it wouldn't resize as narrow as the single column, and there were some other issues (I can't recall now). Unless you can be clearer on what it is about Configurator that does not meet your needs I don’t think your post makes a lot of sense. And what do you mean by: »but it wouldn't resize as narrow as the single column«? I just tried and I could create a Panel 30px wide for example. Please try it again, and write down the limitations of Configurator, as the engineers need clear cases to solve a problem. Thanks! I make a panel in Configurator with all my favorite tools - this is because I prefer to have all my tools visible in a column, instead of having to click and hold to view "sub tools" tools in their fly-out groups. Anyways, I make this panel the same width as the the single column tools panel (40px) In Photoshop. However, the panel always reverts to about 150 px width on restart of Photoshop, and I have to resize it back down. 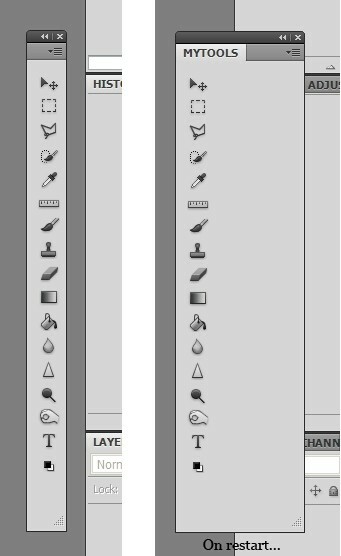 I can't find a way to make the 40 px width of the panel persistent on relaunch of Photoshop. Do you work with CS4 and Configurator or CS5 and Configurator 2? And have you asked about the issue on the Configurator Forum yet? I have Photoshop CS5 (regular not extended version), and I'm using Configurator 2 (052610). I haven't asked on the Configurator forum as I didn't stop to think if there was one...it was a bit of a challenge to even find this forum to submit feature requests. Here's a before and after restart of my custom tool panel. Well, that is indeed not OK. But I can’t currently recreate the behaviour, so I would recommend running the usual trouble-shooting routines (updating all involved applications and the OS, trashing prefs by keeping command-alt-shift/ctrl-alt-shift pressed while starting Photoshop, 3rd party plug-ins deactivation, system maintenance, font validation, etc.) and if the problem persists trying the Configurator Forum. Yep, did everything you mention, but still doesn't stick. I guess the final request is to have built in configurability of the default Tools panel (as is offered in so many apps), without having to employ an external utility. Photoshop is absolutely brilliant with it's customizable key commands and menus, and workspaces...just need to extend that brilliance a wee bit further to the Tool panel. It's not a showstopper, but would be sweet. Fingers crossed it could make it into CS6. im pretty sure i started a topic similar. but now i want to share a possible look for a custimizable tools palette. the idea is that tools are qround the cursor and , it appears, in a keystroke or a wacom button press.